WDAV and NPR have different missions. WDAV respects NPR’s mission to serve as a leading news provider. WDAV on the other hand, exists to serve as a leading provider of arts and cultural programming nationally and internationally. Based on the differing missions of these two organizations, we are working together to find a solution to the issues surrounding NPR World of Opera. We’ll offer updates here as they are available! I strongly support Ms. Simeone in this matter. I stopped supporting NPR stations in my area over the Juan Williams incident. More recently, I went back to supporting a Washington DC station after they had Juan Williams as a guest on the Diane Rehm Show, which they originate. Fair doesn’t seem to matter these days, but level playing field does, to me… What’s good for Scott Simon, Ms. Roberts, and the rest of the NPR “names”, ought to be good enough for Ms. Simeone, and she’s not even an NPR employee. I don’t see where Opera and Occupy Washington are in the same arena. For that matter, if Juan Williams can appear on Diane Rehm’s news commentary show, then Lisa Simeone can appear your opera commentary show. Good luck on your decision. WAMU’s show “Soundprint” DID fire Simeone; you may want to reconsider supporting WAMU. I did. ps the key-captcha is biased against people with motor skills problems like arthritis and carpel tunnel syndrome. And how do people with visual impairments solve the “puzzle”? How is her participation in OWS a problem of any kind? How is it any of your business what she does on her free time? I agree. Her time off is her own. Shame, shame. And by the way, your “Key-Captcha” bot preventer is the stupidest thing ever. I agree totally, what you do or say on your own time is free speech. Lets stand up for all those teachers (and others) that have been suspended or vilified for speaking out against the Gay, Lesbian, Transgender agenda. Stand up for free speech now! Lisa is terrific. She’s smart, kleolwdgeabne, professional, and incisive. (Her political acumen is a great gift, and it’s too bad she can’t just Occupy Puccini ! It could be hilarious!) But she knows how to draw the line between work and citizen action. I’m so pleased that WDAV has had Lisa’s back so far. Please, please, keep it up. Don’t let the haters win. Please don’t deprive listeners of Lisa’s talents. That would be plum foolish.So far, you’ve done the right thing, and I thank you for it. I would strongly urge you to reconsider you action regarding Ms Simeone. Where does it stop? No one who works for you organization can exercise there first amendment rights, period? If you truly intend to pursue that policy, the last one out should not forget to turn out the lights. It’s not logical or sustainable and frankly, you appear to be doing the bidding of yet another political faction, the very thing you sought to avoid in the first place. Exactly what are “the issues surrounding NPR World of Opera”? Lisa Simeone in her own time exercises her constitutional rights. What’s the big deal? How does that create “issues” for the program? Can we have an explanation, please? Please reconsider the decision to fire Ms. Simeone; she has done nothing to deserve her termination. I trust that WDAV will not take any adverse action against Lisa Simeone as host of World of Opera. To do so would violate her rights as a citizen and stain the reputation of WDAV and Davidson College. It is reprehensible that NPR would seek to punish the host of a musical program because she chose to participate in the Occupy Washington events. Do the right thing. Don’t participate in the climate of political purges. One’s political opinions or activities on one’s own time should have no impact on one’s employment. Keep Lisa Simeone on the job and on the air. It is truly a troubled time in the second age of yellow journalism when NPR fails to understand what freedom of speech means. They are no longer relevant to my ears. It’s just the repercussions of such denial of basic human rights does not bode well for our national security in the future. A private individual is just that. Her workplace should not interfere with her personal politics. NPR really does support Simeone’s sentiments, but NPR received so much negative press after the Juan Williams incident and the undercover video of NPR staff calling conservatives terrible names, that they are now spooked and do not want to have direct ties to “reporters” who are too outwardly political or openly opinionated. All NPR stories have a far-left slant, which is the irony. They are not fair and balanced at all, but to maintain some kind of illusion that they are, they severed ties with Simeone, who did not know how to be a more surreptitious leftist communicator like the rest of the NPR commentators. Thanks for the laugh! Much needed after a long day. I am pleased to see that you have not caved in to NPR prrssuee. Their management seems to have become the thought police in recent months. Working for public radio most definitely not mean that someone should have to give up all their rights as a private citizen. Insofar as I have been able to determine, Ms. Simeone’s involvement with Occupy did not involve any kind of on-air comment. So, it was none of NPR’s business!! I’ve been a long-time supporter of public radio, but recently I’ve begun to question NPR’s judgement. The attack on Ms. Simeone was simply unacceptable. NPR has a”far left slant”? What utter and complete nonsense. NPR has been leaning right since the 2004 election. Their political commentators tend to be concern trolls from the DC establishment (Cokie) or Fox News pundits (Liasson). You need to broaden your mind and stop watching Fox News, it rots your mind. This progressive stopped listening to NPR years ago because of this. Please! The far-left!! to the elite progressive Marxist who used to listen to NPR it’s now the far-right if you can believe it. If your not speaking (preaching) about the new progressive Marxist totalitarianism masquerading as the new liberal base, your a right-winger! Beware the moderate democrat, you too will be swallowed up! Thank you for your clarification, your ability to think clearly, and your willingness to treat your contributors fairly. Lisa’s unfair firing by Soundprint and NPR’s involvement in it have made me very upset. I’ve written to both to express my dismay. Thank you for this explanation regarding Ms Simeone’s continued role as host of World Of Opera. Of course, that is as it should be. One thing that is left unexplained is why this was ever an “issue” in the first place. Apparently, as of the time that the initial post of this thread was published, WDAV (and NPR it would appear) believed that Ms Simeone’s participation in a poitical event unrelated to her music hosting duties gave rise to or constituted some kind of problem because, as you noted at that time, both WDAV and NPR were looking to “find a solution” to the issue. You don’t look for solutions unless you perceive some kind of problem. Put simply, what was the “issue” that required some sort of solution? You are fools. WDAV deserves all of the adverse publicity and loss of public financial support it receives. Perhaps an EEOC claim on the part of Ms. Simeone might prompt WDAV to reconsider it’s illegal (termination based on pretext), unethical, and immoral actions. I think it’s time for someone to stand up to the poor decision-making by npr management. Lisa Simeone is a superb on-air professional. I never miss her show when I’m at my home in Charleston. Quite frankly, I am fed up with npr. I no longer listen to its news programs, and it no longer produces cultural programming. I appreciate your integrity in not bowing to pressure from npr. So far its record in dealing with this type of situation is dismal. Do not lower yourself to that level. What are you crazy… During the pledge period you take this kind of action against Lisa Simeone. I suggest those of us that believe in our right of Free Speech, pull any funding for WDAV. It’s none of WDAV’s business what she does in her spare time. No, you won’t be getting my pledge in the future. IF hosts will be fired for political free speech conducted on their own free time, then fire Cokie Roberts for accepting large speaking fees from businesses. NPR is just terrible. Please WDAV let this lady do as she pleases. Free speech is just that! Whether you agree or disagree should have no bearing on free speech. Let her keep her job. Here’s how I understand it: Though some might deasgrie with them, NPR strives to be an unbiased news outlet. That means their reputation as unbiased is important to them. In order to protect that reputation, NPR set out a policy that states all broadcast talent must get permission before engaging in public political expression even if they don’t report on politics directly. Lisa attended a OccupyDC event as a protester, which violated that rule. So NPR terminated their relationship with her.The more I learn about it, the more I see that they didn’t have a choice. She signed a contract that spelled this out, and she violated that contract. NPR’s reputation is one of their most important assets, and protecting it has to be their first priority. Plus, if they let Lisa slide, they could get sued by anyone who did get fired for something similar. Astounding that any radio station would not honor their workers’ First Amendment rights. Evidence of why NPR serves up such bland, government-obedient fair. Too bad, but that’s where we are. Do we live in Russia now where citizens are not allowed to express themselves on their own time? Simeone is not an NPR employee and is not bound by their rules. Do not fire her. It will be another step down the path of injustice if a host of an arts show cannot attend a civil protest on her own time, not pretending in any way to present her attendance as those of her employer. Please do not consider punishing her for her private actions. What’s the problem? Lisa isn’t an NPR employee. Surely that network isn’t going to demand a loyalty oath from free-lance musical commentators. Maybe, next, they’ll want the same from musicians. 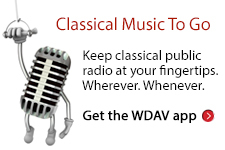 Thank you, WDAV, for letting Ms. Simeone continue to host your World of Opera program. She’s host of a cultural program, not political commentator, and there’s no reason for her to be deprived of her right to express herself in the political sphere. NPR lost its courage–and some of its credibility for me–when it caved to right-wing threats to its funding. You mean my actions have consequences? Even when I’m taking government money? Have all the liberty you want- on your own dime, honey. I see a job opening that can be filled by a muppet. Lisa is terrific. She’s smart, knowledgeable, professional, and incisive. (Her political acumen is a great gift, and it’s too bad she can’t just “Occupy Puccini”! It could be hilarious!) But she knows how to draw the line between work and citizen action. I’m so pleased that WDAV has had Lisa’s back so far. Please, please, keep it up. Don’t let the haters win. Please don’t deprive listeners of Lisa’s talents. That would be plum foolish. So far, you’ve done the right thing, and I thank you for it. What Ms. Simeone does on her own time is her business and NPR should not infringe on her First Amendment Rights. We’ve learned in the past that NPR can be easily intimidated by the Washington establishment and big dollar donors. WDAV just made me a contributor by doing what’s right, not what is politically correct. Way to good lady! They at NPR are cowards. What we tend to accept as normal now is the result of bushboy and the neocons takeover of CPB and NPR by naming Tomlinson and other cons to the boards, which resulted in a sharp rightward tilt that continues. It’s ironic that even after NPR kisses the right wing’s patoot frequently and daily, they have managed to pull about all funding anyway. In Florida, p.Rick Snott and the rethuglican legislature has taken funding to ZERO. So NPR is losing its real base by kissing up to the right while they are spurned by the right. Sounds like Obama. How’s that working out for you, guys? Without government funding they could be a powerful voice for the center and left, but it takes a leader with backbone to get them there. Glad you’re keeping her on, and not giving into pressure from NPR or from anyone else! Can we change the hated phrase for a new way? What if the business of America were something other than just ‘business’? Thank you, WDAV in your continuing support of Lisa Simeone! Actions do have consequences. I’m a vrateen myself. I am going to pull my support for NPR over this, because Ms. Simeone is correct NPR is exhibiting a double-standard by firing her, while retaining others who are overtly political in their own activities outside of NPR. Also, NPR and its subcontractors cannot possibly have missed that Ms. Simeone has been a political activist for a long time I am disgusted by the fact that they are suddenly taking a stand NOW, but only against Ms. Simeone. Ms. Simeone has my support in this. NPR does not NPR personnel have the right to their freedom of speech as well, but their actions ALSO have consequences. Thanks for standing up for Ms Simones rights. The rigt of free speech is incredibly important and is being nibbled away daily. The right of any person to act & react to policy on their own time, in their own way should never be impinged upon.